A good night sleep is incredibly important and it can greatly impact on both physical and mental health if you become sleep deprived. A bad night sleep can be due to many reasons, but one of the main causes can be the bed, which in addition to affecting sleep, can also make conditions such as back pain worse. It's therefore essential that you invest in the highest quality beds for your residents to ensure a restful night sleep! We've recently started selling our Waterproof Divan Set which is a functional, yet comfortable bed - perfect for use in care homes. This features six sturdy beech legs with room for hoist access if required. For ease of use it also has stainless coasters which means the bed can be moved easily. 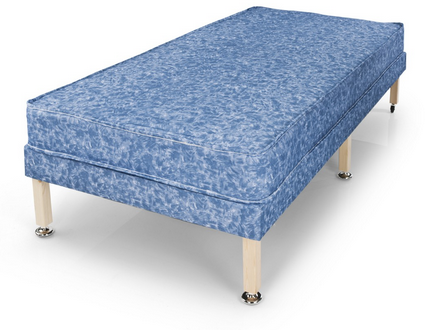 We understand that care home furniture products are required to be extremely durable and so the divan bed base and mattress are finished with antibacterial, waterproof fabric. In addition to meeting the day to day demands of care homes, your beds must also look great and so we offer numerous options for headboards to compliment your interior. You can finish off the room with our wide range of bedroom care home furniture which includes wardrobes, drawers, bedside tables, tv units and many different accessories â€“ designed to create a home from home in your care home. We also stock soft furnishings and bedlinen so you can find everything needed for care home beds in one place. If you would like to find out more about our care home furniture and beds then please get in touch with a member of our team will answer any questions you may have.